The trapplique technique was a lot of work, requiring multiple hoopings for each frame, as well as precision cutting and placing. We probably won’t do more of that. 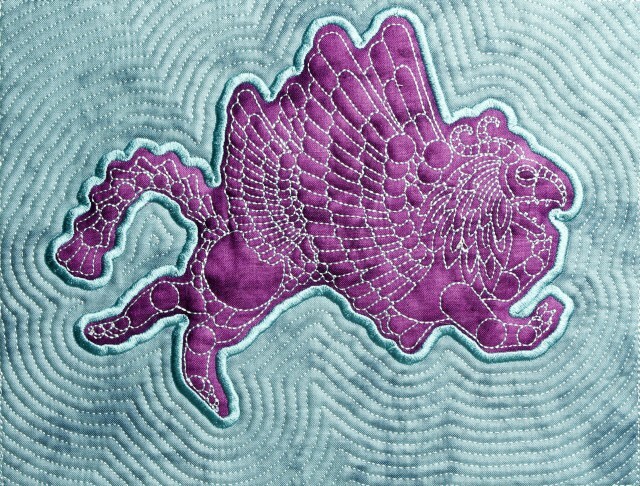 Our next project is more traditional embroidery with just one color of fabric and multiple colors of thread. Whole lotta math required to make this work, which is fortunately Theo’s department. Meanwhile I’ll stitch together these 12 frames into some sort of viable wall hanging. Have you thought of arranging the frames in a way resembling a zoetrope, so they could be seen moving in a real room? Imagine a kind of lampshade which could rotate arould its center, with 12 flaps (the frames) hamngig from it, and 12 slits between them. If this rotates and you look through the slits: movement! Really cool project and effect. However, there’s something oddly wrong in your technical description of the images: GIF is a lossless compression format, it doesn’t throw away any information in the compression. In contrast, JPG is a lossy compression format–it deliberately discards the information that is least perceptible to the human eye to get higher compression ratios. So saying that the still is “without all the .gif compression” is strange. Really wonderful. I wonder what the Bayeux Tapestry would look like, animated? God bless computer science! Similar to what David mentioned, the artifacts are due to color-reduction. Since GIF is limited to 8-bit (256 colors) the program creating it usually employs color-matching or dithering to try to produce a decent result. Hopefully, the adoption of APNG which will allow 24/32-bit color will solve this issue in the long run so that animators do not have to compromise on quality. The offsets around the outside kind of look like a cymbal clashing when animated. Very cool. “Similar to what David mentioned, the artifacts…” bla bla bla mansplaining. INSANELY COOL ANIMATION! I’m very impressed by your work.